The Rodos Sun Apartments feature 40 apartments all self-contained with a fully equipped kitchenette including stove and fridge. Each apartment has twin beds and a third bed may be added on request. Each apartment has a private balcony with the choice of a pool view or a peaceful view of the gardens. Cots & Air Conditioning available (local charge). 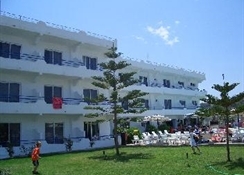 Enjoy a well priced fun family holiday in Rhodes by booking the Rodos Sun Apartments. 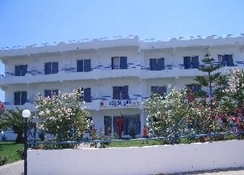 The Rodos Sun Apartments are situated in a peaceful location of the resort of Faliraki. These apartments offer great facilities and are only 500 metres from the beach. Enjoy the buzzing centre of Faliraki where you will find bars, restaurants and lively nightlife making this an ideal choice for families, couples and groups. Rodos Sun Apartments is a fun, friendly family run establishment consisting of 40 self-catering apartments. Local Tips: Rhodes International Airport is located 18 kms. Food, Drink and Entertainment: Restaurant, Snack Bar, Occasional BBQ. Sports, Games and Activities: Large Swimming Pool, a small relaxing pool joined to the main pool, Pool Table, Arcade Games, Occasional Evening Entertainment including Bingo. For the Kids: Arcade Games. Additional: 24 Hour Reception, Safe Deposit Boxes (local charge), Internet Access, Satellite TV in Bar, Laundry Service, Car Hire, Foreign Currency Exchange.